Before the release of Paul, the latest comedy written by and starring Simon Pegg (this time along with Nick Frost), the word was that the film wasn’t very good. An uninspiring teaser trailer only deepened suspicions: seemingly featuring more brash explosions than pointed comic moments, it looked silly, and not in a charming way. A closer look at the poster might have hinted as to why: “From the producers of Hot Fuzz”; not the director, but the producers. Although it was being pushed as another comedy in the mould of Spaced (1999-2001), or Shaun of the Dead (2004), it had no links with the director of those projects, Edgar Wright. Yet the movie’s own director, Greg Mottola, is certainly a capable filmmaker (he last made the delightful Adventureland ), and while his latest may finally feel a little one-note, it still offers a number of pleasures. Paul’s is a relatively simple story. Two likeable British man-boys, Clive (Nick Frost) and Graeme (Simon Pegg), travel to Comic-Con - San Diego’s huge fan-centric celebration of all things sci-fi, comic, and nerd-related - and then head off on a cross-country journey through America’s legendary U.F.O hotspots. En route they encounter a real alien, Paul (voiced by Seth Rogen), who is being chased by government spooks, led by Jason Bateman. Clive and Graeme bond with Paul and set out to help him get home before the government can capture him for experimentation. Cue much mayhem. Mottola and Rogen’s presence highlight the extent to which Paul constitutes a fusion of a particular brand of British comedy with a contemporary American Apatow-esque mode, and the fact that it doesn't quite gel together is something I discuss in the Alternate Take. Certainly the film lacks the dazzling stylistic attention to detail of Hot Fuzz, and our central duo are also blander here than they have been elsewhere, their bickering relationship feeling less sharp than in earlier collaborations. Thankfully the supporting cast (especially Bateman and Kristen Wiig), including Paul himself, liven things up considerably. 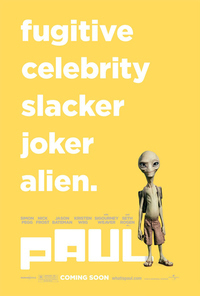 Both charming and foul-mouthed, Rogen plays another version of his familiar slacker self, but there is an undeniable joy in seeing this persona exist under the guise of Paul the alien, where his swearing and joint-smoking by and large come across as amusingly incongruous rather than annoying. Paul is also a love letter to science fiction, Steven Spielberg (who appears in the best of the film’s many cameos), and the concept of the U.S. road trip. Its referentiality will put some people off, and the continual nods to likes of E.T (1982) and Star Wars (1977) will likely either start to wear the viewer down or go over their head (one Star Trek gag left me in some confusion). All the warm self-congratulation guarantees that the overall feel of Paul is one of slightly cloying but generally comforting cosiness: a bunch of largely personable people making a funny if forgettable film for people who share their tastes, and seemingly having a great time whilst doing so. This review was published on March 17, 2011.